Liam Mellows - In the wrong place at the wrong time. On December 7 1922, Pádraic Ó Máille TD and his friend Sean Hales TD of Cork, walked out of a hotel on Ormonde Quay, by Dublin’s river Liffy. They just had lunch, and were on their way back to the Dáil in Leinster House, a short drive away. Ó Máille, Galway city and Connemara’s first TD, had been appointed Leas Ceann Comhairle (deputy speaker ). As they reached their car a gunman stepped forward and opened fire. Both men were hit, but Hales was bleeding profusely. Although seriously injured Ó Máille managed to get Hales into the car and drove to the nearest hospital, where he collapsed. Hales was dead. In the year leading up to the shooting Irish politics and the future of British rule in Ireland was completely turned on its head. A truce was called between Britain and Ireland, bringing to an end two years of bitter skirmishes, ambushes, and assassinations. On December 6 1921 a treaty was signed between representatives of Dáil Eireann, and the British government, giving birth to the Irish Free State. Twelve months later, December 6, the day before the Ó Máille and Hales’ shooting, the Irish Free State was formally established by Act of Parliament. The British immediately began to withdraw all its troops. However, despite this extraordinary achievement, an almost miraculous outcome after centuries of efforts for self determination, there were no cheering crowds, no military parades, no public holidays. The Irish were not at peace with themselves. When The Treaty terms were presented to the Dáil on December 14 the previous year, it was debated for nine days. It was not a perfect document. Ulster had opted out; and there were numerous conditions that rankled, such as Ireland would remain within the British Commonwealth of Nations; all TDs were required to take an oath of fidelity to the king. Many republicans found that unacceptable. Michael Collins argued that the treaty gave Ireland ‘the freedom to achieve freedom’. But passions were raw. 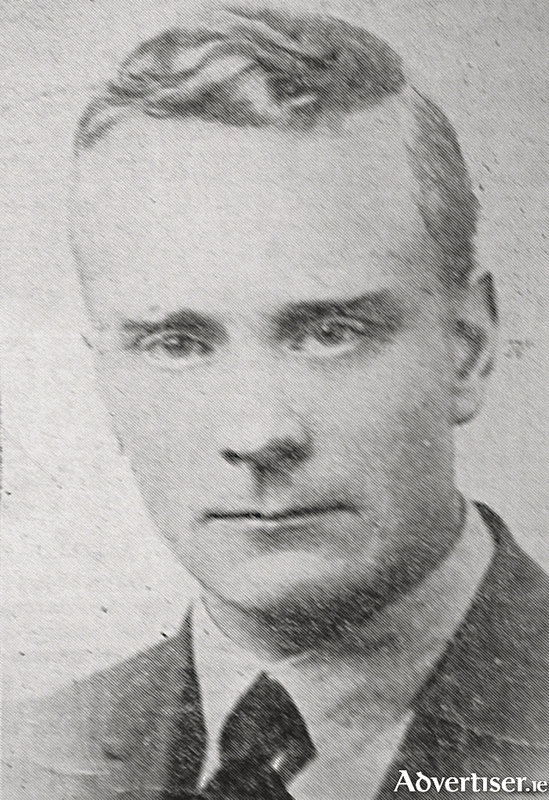 Liam Mellows TD (East Galway ), who had bravely led the Galway insurrection during Easter Week 1916 (with whom Pádraic Ó Máille had fought ), now believed that the prize did not reflect the bitter war that was waged. Mellows, articulate, passionate and brave, who shared a dream for a socialist Ireland with James Connolly, believed, with others, that the Treaty was a betrayal of the 1916 Rising. A vote was taken on January 7 1922. The Treaty was accepted by 64 to 57. The debate was thrown open to the public who were invited to show their preference for pro-Treaty or anti-Treaty candidates in the General Election of June 1922. Sinn Féin split between the pro and anti sides; Ó Máille stood in favour of acceptance. The pro Treaty candidates won more than 75 per cent of the seats. Michael Collins, commander of the Free State army, had hoped for speedy and peaceful reconciliation with the anti Treaty forces, or Republicans. He urged them to accept the people’s verdict. But the anti Treaty deputies refused to return to Leinster House. Spasmodic fighting broke out as the army confronted armed Republicans. The Four Courts, and other landmark buildings in Dublin, were seized. Despite Collins’ efforts to get them to surrender, he was forced to dislodge them with artillery. Its occupants were all arrested. They included Rory O’Connor, a prominent IRA leader during the War of Independence, and Liam Mellows. Fighting now erupted, particularly in southern counties, with a ferocity and mounting casualty numbers which between October 1922 and May 1923 would become greater than during the War of Independence. It rapidly spiralled into a grotesque Jacobean tragedy; with summary executions, notorious atrocities, anti Protestantism, house burnings, and sheer butchery. Following Collins’ death, on August 22 1922, the Free State Government, Cumann na nGaedheal, led by WT Cosgrave, Richard Mulcahy and Kevin O’Higgins (Minister for Justice ) took the position that the anti-Treaty republicans were conducting an unlawful rebellion against the legitimate Irish Government. They should be treated as criminals rather than combatants. The controversial Public Safety Bill empowered military tribunals to use the death penalty for a variety of offences. The anti-Treaty forces, led by IRA Chief of Staff Liam Lynch, regarded the Public Safety Bill as a‘ Murder Bill.’ He ordered his men to kill every TD or judge or journalist who supported it. Mellows, born an Englishman, and just 24 years of age in 1916, had dedicated his adult life to Irish freedom. He had a romantic streak about his boyish looks. But he was hardned enough to train and lead about 700 volunteers in abortive attacks on Royal Irish Constabulary stations at Oranmore, and Clarinbridge, Co Galway, following the Rising in Dublin on Easter Monday. Mellows’ efforts were doomed, not from lack of commitment from him or his men, but from practically no effective arms, and ammunition. The Galway Volunteers were jeered and mocked as they were led off to prison. Mellows, however, escaped to America, disguised, in his favourite alter ego, as a priest (he had previously used the collar to return to Ireland after he was transported to England ). In reality, he was, in fact, a very spiritual man. But he was deeply unhappy in America where he spent four years. Part of that time was in the notorious ‘Tombs’ prison in New York, after he was accused of helping Germany win the war. Disguised as an American seaman he had attempted to get to Germany to buy arms. There seemed to have been no great rush to have him released. He was ill, and practically starving on one occasion. He worked and lectured with Irish Fenian John Devoy; but rowed with others. He helped de Valera’s fundraising visit 1919 - 1920, which probably helped pave a way for his return to Ireland. Next week: I will look at the time Liam Mellows spent in America, in Conor McNamara’s excellent War and Revolution in the West of Ireland, recently published by Irish Academic Press. NOTES: *In total 77 men were executed in reprisals for attacks on Government, Army, or public figures by the anti Treaty forces. The reprisals were a significant factor in bringing the Civil War war to an end. O’Higgins was regarded as the hard man of the Government. Rory O’Connor, who had been shot, was not only a friend, but was the best man at his wedding only months before. Yet he still gave his approval for O’Connor’s execution. Hostilities came to an end when Éamon de Valera led the anti-Treaty TDs into the Dáil under the Fianna Fáil banner. O’Higgins, who had set up the unarmed Garda Siochana to replace the disbanded RIC, was himself assassinated on July 10 1927.